Itron (Neptune Brand) has a product to meet your industrial liquid flow measurement, mass flow control, loading, batching, blending and process control application requirements. 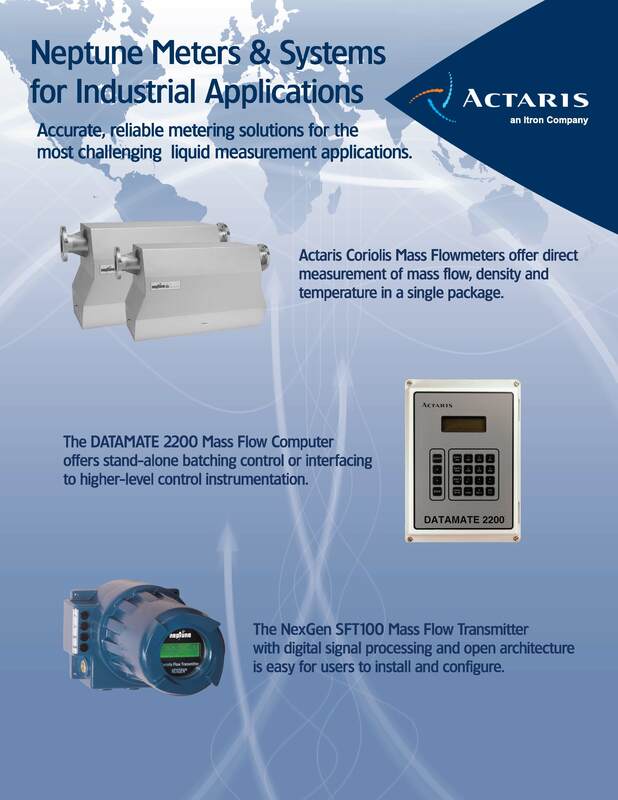 You may recognize these products under the Schlumberger Coriolis Mass Flow Meter and Neptune Oscillating Piston & Nutating Disc Volumetric Flowmeters and Registers, Batch Controllers and Transmitters, for the Industrial Markets. Marsh Instrumentation provides Canadian Sales and Service for the Industrial marketplace. The newest addition to the Family is the Neptune M100ST 1" Coriolis Mass Flowmeter, providing a cost effective, short length configuration, to monitor critical liquid flow applications. To view or download the M100ST data sheet, click here.